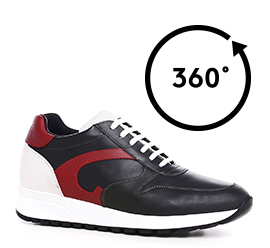 Sneakers with internal elevator system to increase height from 2.4 (6 cm) up to 3.1 inches (8 cm) with upper in black full grain leather and details in red and white calf leather. The sole is made of natural rubber. The colours combination reinterprets the iconic models of the '80s and' 90s enhanced by a street style influence.